Ol' Backwoods has been buying and trying MRE's lately. "Kook!" Now, hold on. I carry MRE's in my Bug-Out Bag that I keep in my truck cab (it's a big truck) for a good reason. I am going to be traveling about 9 hours from my home for business quite a lot in the next year, and I do NOT want to get stranded by a hurricane, or ice storm, or other nasty business without some high-calorie, decently-tasting food with me. If I am stuck far from home, or God forbid, having to hoof it home, I want to be able to have enough calories to keep going and be thinking straight, and have enough of it for at least 3 days. 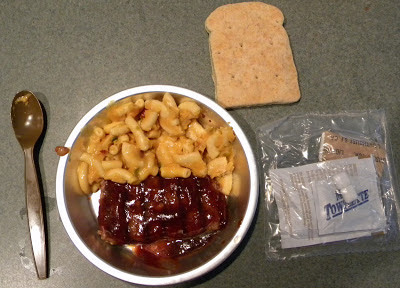 MRE's, or Meals, Ready-to-Eat (as my military buddies say, "3 lies for the price of one), are ideal for this use. If you keep them fairly cool, and the inside of a car is most of the time (for the occupants' sake), they are fairly palatable, and high in calories. 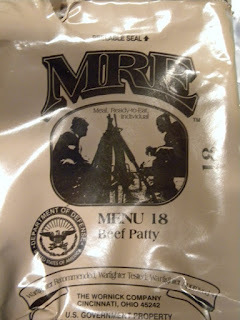 To help you fill out your bug-out bag with MRE's, I'm going to make a series of blog posts about the different menus. I'm using the Army-spec MRE's from The Warnick Company of Cincinatti, OH, but others are similar. REGULARITY: Could eat every other day, probably. I heated the MRE main and side dishes at the same time, using the chemical heater provided. When they were hot, I put the two into my camping plate, which I keep in my bug-out bag, and ate with the provided plastic spoon. I do carry an Eat'n'Tool (well, a cheap Chinese equivalent), but I wanted to see if the MRE spoon was adequate. It was. I ate the Cheddar Cheese Crackers and Cheese Sauce while I was waiting. The "Combos"-style crackers were fantastic, I thought, for an MRE snack. The cheese sauce helped them not to be so dry, and generally improved the taste overall. The Beef Patty itself wasn't too bad, once it was covered in the BBQ sauce (which is Texas/Memphis style, not North Carolina or Northeast style). The Mexican Macaroni and Cheese was not too bad, until it began to cool. It becomes a little plasticky then :-) My advice is to keep it in the MRE heater, sealed in its pouch, until you finish the Beef Patty. I did not find the Wheat Snack Bread to be incredibly palatable, because it was so bland, and so dense. If I was in the field, I would save that for when I had some savory sauce to dip it in. Or maybe, I should have used the Cheddar Cheese Sauce for that. Heated in the leftover MRE heater water, that would have been good on the Wheat Snack Bread. Overall, I think I will go ahead and get another MENU #18 and stash it in my Bug-Out Bag. I think that would be a fine meal for a refugee from some kind of disaster. Myemergencysupplies.com is the right place from where civilians can buy MREs in a cost-effective manner. Try it!